Ad for festival found on train in Japan. No, it’s an Asian Confusion Beard. Maple Bingo: It’s not just for Canadians any more. Eh? Your Honor, I thought she was inviting me to play bingo. Call me when it’s a whole smile. 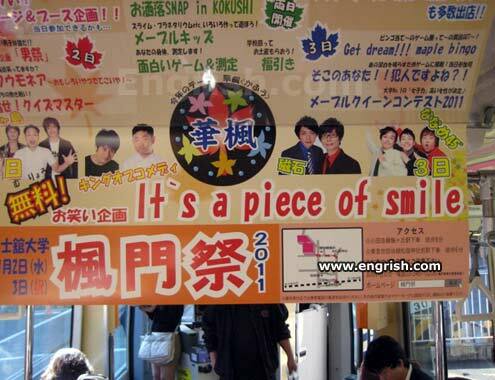 I’ve been looking for a piece of something, but I don’t think it was smile. When I go to Maple Bingo I usually get nightmare. Looks like a 1980’s version of a Japanese Facebook. I remember when my Aunt Jemima used to go to maple bingo with Mrs. Butterworth. Those two always stuck together! The piece of smile that surpaseth human understanding. My, my, my. So many disgruntled maple bingo players red-thumbing every comment. Ah Kitsume. I have something mysterious from the west, that wil bring a smile to your lips. So that’s what the Toronto Maple Leafs do after hockey season … they play bingo. Cool, Maple Bingo! Can I get a piece of the action?